Until this morning, the official data showed that the U.S. productivity growth accelerated during the financial crisis. Nonfarm business productivity growth supposedly went from a 1.2% annual rate in 2005-2007, to a 2.3% annual rate in 2007-2009. 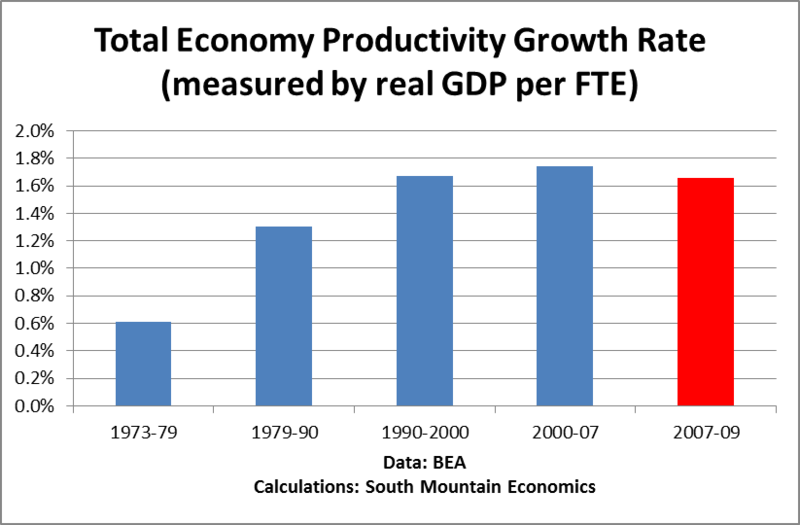 Many commentators suggested that this productivity gain, in the face of great disruptions, showed the flexibility of the U.S. economy. Uh, oh. The latest revision of the national income accounts, released this morning, makes the whole productivity acceleration vanish. Nonfarm business productivity growth in the 2007-09 period has now been cut almost in half, down to only 1.4% per year. First, the measured rapid productivity growth allowed the Obama Administration to treat the jobs crisis as purely one of a demand shortfall rather than worrying about structural problems in the economy. Moreover, the relatively small size of the reported real GDP drop probably convinced the Obama economists that their stimulus package had been effective, and that it was only a matter of time before the economy recovered. A more accurate reading on the economy would have–perhaps–cause the Obama Administration to spend more time and political capital on the jobs crisis, rather than on health care. In some sense, the results of the election of 2010 may reflect this mismatch between the optimistic Obama rhetoric and the facts on the ground. Now the productivity surge of 2007-09 has vanished, and so is the pretense that the U.S. economy was able to sail through the financial crisis with barely any problems. It’s time to set a new economic course. 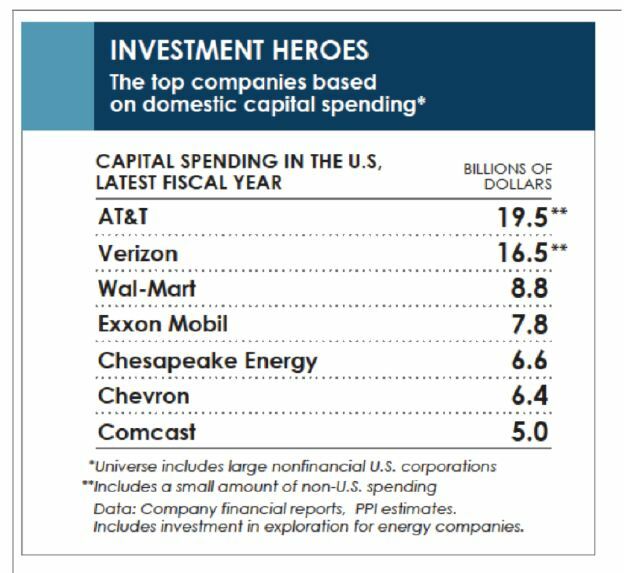 Investment Heroes: Top Companies for Domestic Capital Spending. As we know, the U.S. is still stuck in a capital spending drought. According to my calculations, nonresidential business investment in the first quarter of 2011 was still 23% below its long-term trend. By contrast, nonfarm employment is about 8% below its long-term trend. In 2010 AT&T was the domestic capital spending leader, by a wide margin. Verizon was next, followed by Wal-Mart. These are companies that invested huge sums into the domestic economy, at a time when many other companies were still holding back. Out of the top seven “investment heroes,” 3 were telecom companies, 3 were energy companies, and 1 was a retailer. [Before you ask, I’m not ready to release the rest of the list yet. Some companies break out their U.S. vs non U.S. capital spending, but many don’t, so it takes time to estimate and verify the breakdown based on other financial data ]. The overarching aim of economic policy should be to encourage all three types of investment, since all are essential for long-term prosperity. In particular, those companies which continue to invest in the U.S. need to be acknowledged for their contributions to the domestic economy, especially when other companies of equal size are investing much less at home. I wouldn’t go as far as to give them a medal, but let’s give them their due. Rather than resorting to financial trickery, these investment heroes are making money the old-fashioned way–by spending on productive long-lived assets which will generate economic benefits for years to come. *Some might argue that the U.S. has been able to generate good productivity gains since 2007 without capital spending. 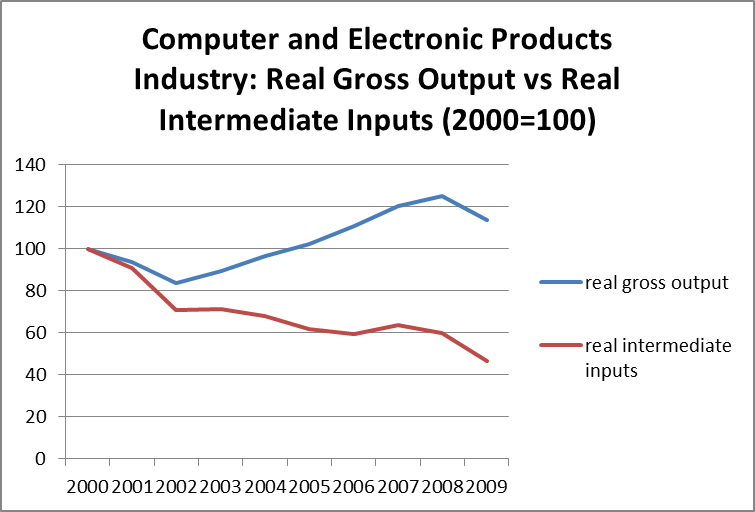 But as regular readers of this blog know, I am skeptical of the stunning productivity gains that the official statistics seem to report for many industries in 2007-09, the middle of the financial crisis (see this post here, for example). I don’t mean to be apocalyptic here, in the face of the terrible tragedy hitting the Japanese people. But I think the current crisis is going to accelerate the aging of Japanese society, especially if the nuclear disaster gets worse. And I’m wondering whether we are seeing the beginning of the end of Japan as an industrial power. Think about this from the perspective of an executive running a major Japanese manufacturer. In the short-term, when you are facing all the problems at home, you may find it appealing, wherever possible, to ‘temporarily’ switch over much of your production to either China or the U.S., your two major markets. This can be justified, patriotically, as the need to keep up profits to help fund the reconstruction of Japan. 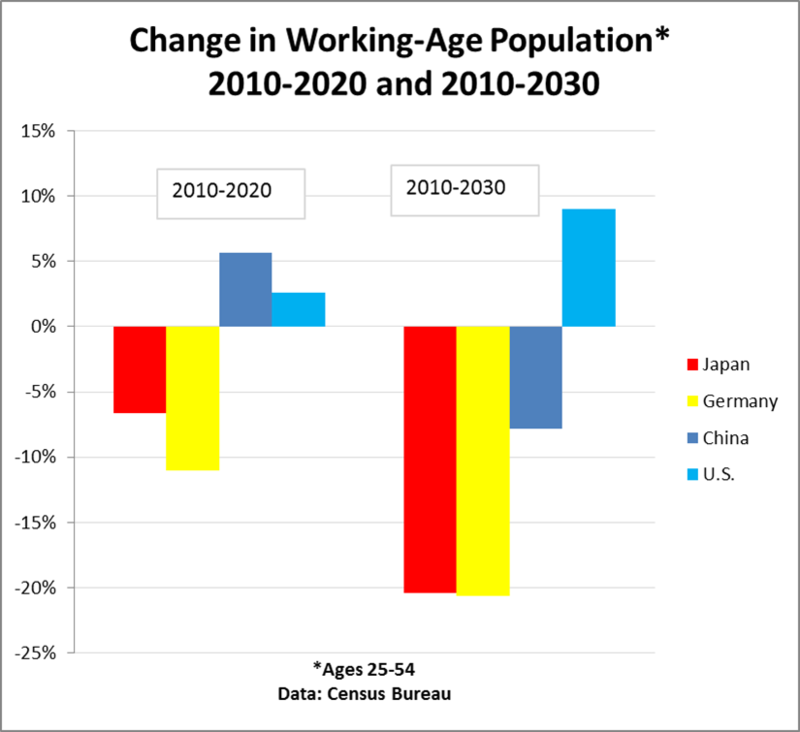 Basically, Japan’s working-age population is anticipated to drop by 20% over the next 20 years. And that actually understates the problem in the rural areas, which have felt a youth drain to the big cities. ( see here and here ). That makes it much more attractive to invest in China and the U.S., of all places, which have more desirable demographics for both the workforce and consumption. Ten years from now, much of what is made in Japan today will be made elsewhere. When Did the Innovation Shortfall Start? I’m responding to the posts by Arnold Kling and Bryan Kaplan critiquing Tyler’s The Great Stagnation. Let me just throw out some thoughts, from the perspective of someone who thinks that The Great Stagnation is a terrific book. 1. I agree wholeheartedly with Tyler that the current crisis is a supply-side rather than a demand-side problem. That explains why the economy has responded relatively weakly to demand-side intervention. 2. From my perspective, the innovation slowdown started in 1998 or 2000, rather than 1973–sorry, Tyler. The slowdown was mainly concentrated in the biosciences, reflected in statistics like a slowdown in new drug approvals, slow or no gains in death rates for many age groups (see my post here), and low or negative productivity in healthcare (see David Cutler on this and my post here). 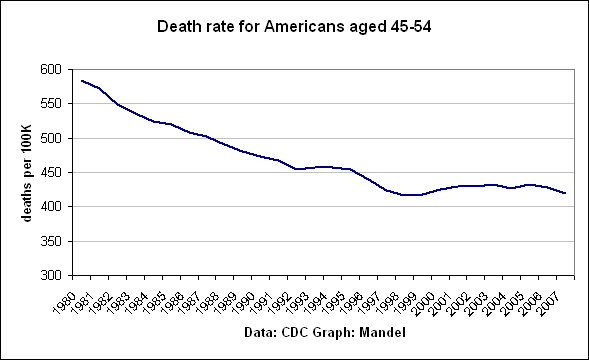 This is a chart I ran in January 2010 (the 2007 death rate has been revised up a bit since then)–it shows a steady decline in the death rate for Americans aged 45-54 until the late 1990s. The innovation slowdown was also reflected in the slow job growth in innovative industries, and the sharp decline in real wages for young college graduates (see my post here). (Young college grads, because they have no investment in legacy sectors, inevitably flock to the dynamic and innovative industries in the economy. If their real wages are falling, it’s because the innovative industries are few and far between). 3. 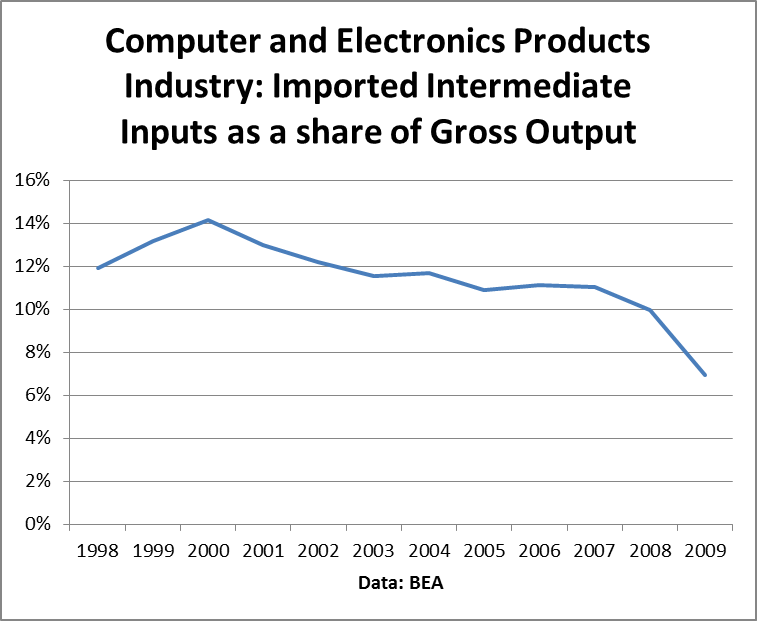 The apparent productivity gains over the past ten years have been a statistical fluke caused in large part by the inability of our statistical system to cope with globalization, including: The lack of any direct price comparisons between imported and comparable domestic goods and services; systematic biases in the import price statistics (see Houseman et al here, for example); and no tracking of knowledge capital flows. I’ve got several posts coming on this soon. 4. I agree with Tyler that regulation of innovation is a big problem. That’s why I’ve suggested a new process, a Regulatory Improvement Commission, for reforming selected regulations. 5. I’m of the view that we may be close to another wave of innovation, centered in the biosciences, that will drive growth and job creation over the medium run. If we want growth and rising living standards, we need to avoid adding on well-meaning regulations that drive up the cost of innovation.